Birch, Cherry, Apple, Oak, Fir and Spruce. Leaves become skeletonized. As larvae mature they consume the entire leaf except for the main veins and petiole. They tend to feed on the upper third of the tree first. If uncontrolled, they can cause severe defoliation. Eggs are laid in a foamy white egg mass and hatch in late June and early July. 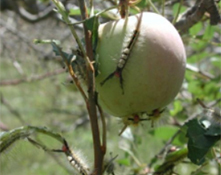 Larvae may be present in trees from June through August when they are large and close to maturity. Larvae are 35mm in length, reddish-orange head, hairy body and have 2 light yellow lines running along its length. It has 4 brush-like tufts or bunches of light tan hairs on the back (top of the first 4 abdominal segments) and red dots on abdominal segments 6 and 7. A pair of longer tufts of black hairs rises from the prothorax. These hairs can irritate the skin. Pupae are grey cocoons spun of silk and body hairs. They are found on twigs, branches and crevices in bark. The adult male moth is ash gray with a wingspan of 26-30 mm. Its forewings are marked with darker wavy bands. The adult female moth is creamy white to gray, hairy and flightless. Egg masses are found on trunks and branches of trees throughout the winter. Collect and destroy eggs during fall, winter early spring. Perform treatments of approved insecticides during early activity of larvae. 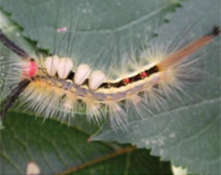 The hairs on the tussock moth are hollow and contain a toxin that penetrates the skin. People handling these insects often exhibit allergic reactions such as painful rashes or respiratory problems. 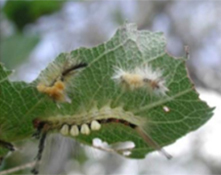 The Tussock Moth damage is often confused with Gypsy Moth feeding as they both feed heavily on trees and cause defoliation.